Glass Vessel Sink in Mediterranean Seashell with Waterfall Faucet in Brushed Nickel is rated 4.6 out of 5 by 13. Rated 5 out of 5 by snowhite from Enchanting Received last week, it is more beautiful than the pic's online. Great job Vigo. It all arrived perfectly and you go way above in packaging to secure from damages. 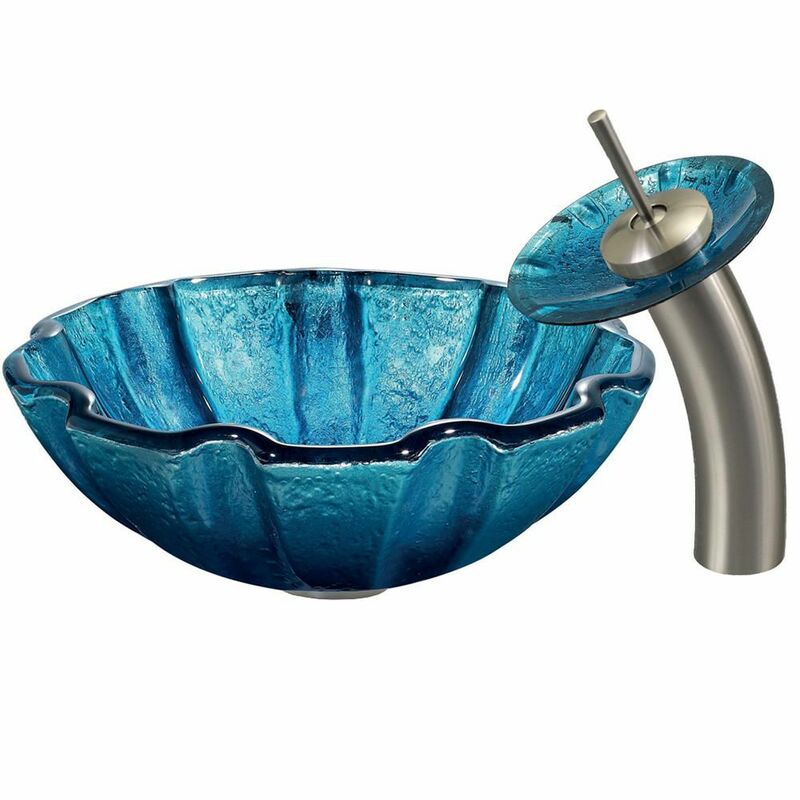 Rated 5 out of 5 by Bandie from Vigo-Glass Vessel Sink and waterfall faucet I ordered 2 and I absolutely love them, will look gorgeous in our new house, They were well packed also so arrived safe.Thanks Home Depo. Rated 5 out of 5 by Frances from Beautiful Color. Haven't installed yet but am sure it... Beautiful Color. Haven't installed yet but am sure it will look wonderful in new bathroom. Rated 3 out of 5 by Doublerr from Pretty shape, very destinctive. But it was too turquoise. I was looking for cobalt blue. Also it ... Pretty shape, very destinctive. But it was too turquoise. I was looking for cobalt blue. Also it says glass, but it was more like ceramic. And it had several splotches of black within the sink itself. We returned it and went for a darker blue. Rated 5 out of 5 by Anonymous from Newton, Nc Love this sink! Such a beautiful color. Get compliments all the time on sink. It also arrived very quick. Rated 5 out of 5 by punkin from Love this. This is a statement piece in the bathroom, people come and just want to play in the waterfall. We love it. Rated 4 out of 5 by gbr1 from Very unique I wanted a sink and faucet that was different and this fits that requirement.